This article is a stub. Please help by editing it and share your knowledge. 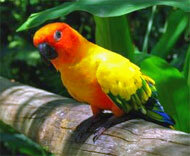 The Sun Conure is a popular parrot in aviculture. It can be found in northeastern South America, where it is endangered.